A new generation of learning applications and lower cost devices in classrooms have made digital learning increasingly accessible for more and more students. With 88 percent of U.S. school districts equipped with broadband connections and Chromebook’s share of the U.S education market at 58 percent in 2017, students are better positioned than ever before to take advantage of digital learning tools. BYOD policies introduce a cornucopia of operating systems into the classroom. User preferences and security settings must be managed and monitored if teachers are to provide a common learning environment. While Chromebooks make access to the Internet simple and more affordable, many of the popular teaching apps designed for Macs or Windows operating environments don’t work on Chromebooks. These lightweight computing devices can’t easily support demanding software, such as CAD/CAM and other tools needed for STEM classes. Students who use older or different computing devices at home cannot access the instructional resources provided in school, creating an additional equity barrier for educators to overcome. What if teachers could give their students a learning environment that looks the same and operates the same for every student, regardless of what devices they’re using? Better yet, what if that environment could be a simple, turnkey service? That’s the genius behind the next wave of desktop virtualization, known as Desktop-as-a-Service (DaaS). 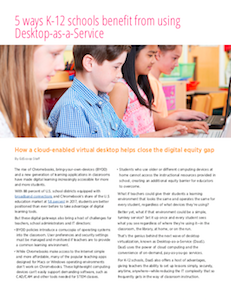 In a new special report from Amazon Web Services and Intel, educators can learn how DaaS uses the power of cloud computing and the convenience of on-demand, pay-as-you-go services to benefit K-12 schools. Download the special report or learn the steps needed learn to get started at your school. This article was produced by EdScoop for, and sponsored by, Amazon Web Services and Intel.